No, really, I have a fever and I’m on freaking fire over here. This is the cold from hell. Ok, I’m also on a fire streak as Little Miss Baker McBakerson. Now The Best Bread you’ve ever had. 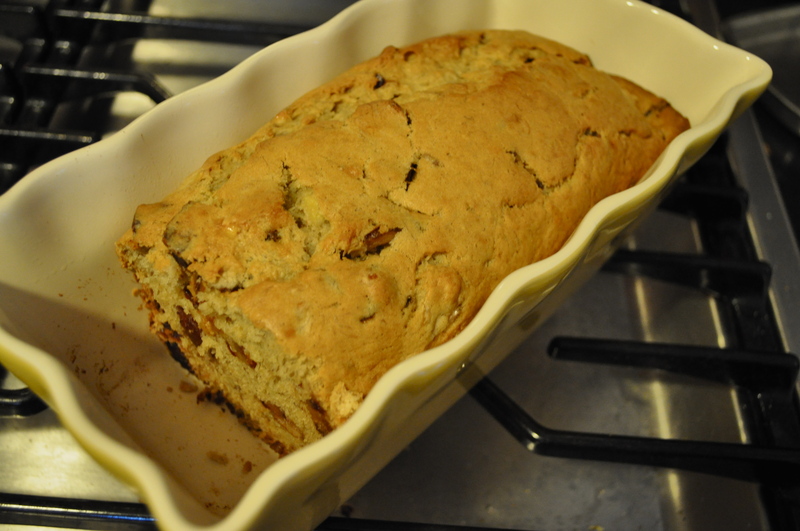 Of course I couldn’t eat all the bananas I bought at the Co Op and since Bubby barks at me when I waste food (not really; I try to get him to yell at me because feel so guilty to throw food away I have to wait until other life forms are growing on it) I wanted to make some banana bread. But not just banana bread. 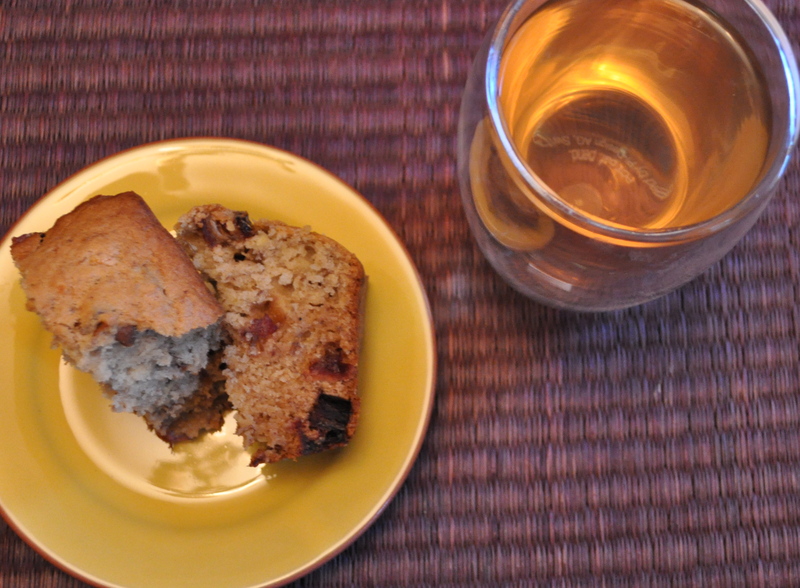 You know how you hate it when banana bread is kind of dry inside? Me too. I wanted to add a little something else. But nuts aren’t good for my kidney stones and I was hard pressed to find an addition that sounded good. 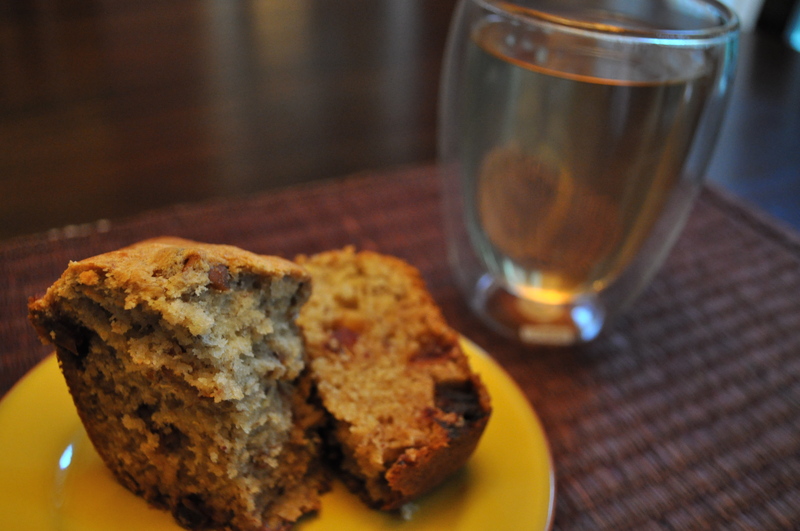 So I googled “banana date bread” (because, uh, dates are amazing…) and found this. I also checked 101 cookbooks because I really like her stuff and found this. Place the bananas on a cookie sheet. Bake in the oven for 12 minutes, or until the skins are black and they have started to seep. Remove from the oven, set aside, and let cool. Sift the flour, baking powder, baking soda, and salt into a mixing bowl. (Don’t you love sifting? It’s so fun.) Set aside. In a separate bowl, cream the butter and sugar for about 3 minutes. Add 1 egg. Mix until completely incorporated and then add the second egg. Mix again until completely incorporated. Squeeze the flesh of the bananas out of the skins and into a small mixing bowl. Add the coconut milk and vanilla and mash together. Add half of the banana mixture to the butter/sugar bowl and blend thoroughly. Add half of the flour mixture and mix until combined. Add the remaining banana mixture, blend thoroughly, and add the remaining flour mixture; mix just enough to thoroughly blend the ingredients. Fold the dates into the batter and pour it into a lightly greased 9 by 5-inch loaf pan. I baked it for 60 minutes. Then 8 more. And 4 more. And another 4. And finally 2 more. They say to bake it for 1 to 1 1/4 hours, or until a toothpick inserted in the center comes out clean. That works too. With a side of Tazo Rest tea, it made for the perfect I-feel-like-poo pick-me-up dinner. I’d offer you some but you don’t want my cooties. Be sure and take your echinacea vitamin C zinc supplements… summer colds bite. We made the carrot cupcakes twice too… ;o) Thanks for this wonderful recipe share. Sending blessings & healing your way! I am distracted by the slice on your plate. You cut very nice slices.